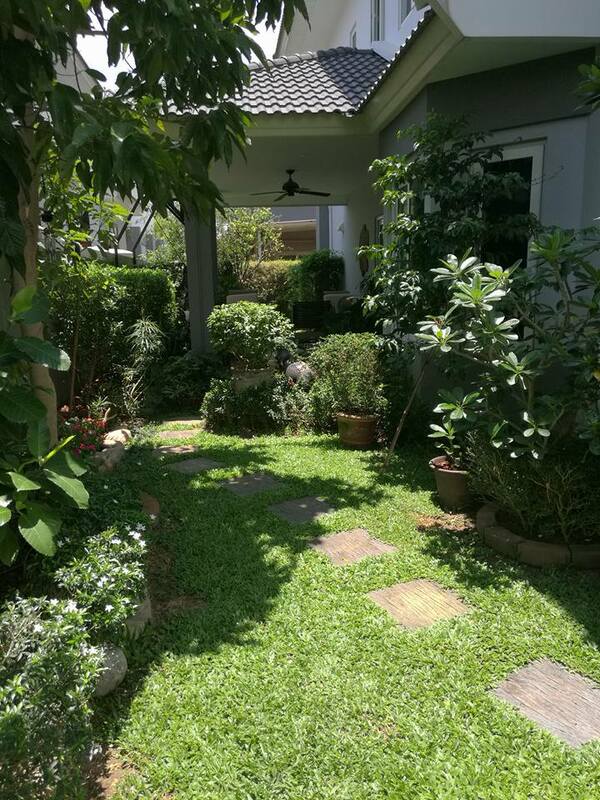 Rest is not idleness, and to sometimes lie under trees or on the deck, listening to the murmur of birds, or watching the clouds float across the sky, is by no means a waste of time – it’s often a way of life living tranquil in Thailand. Such is the joy of living easily in retreat. I have been distracted on matters of health and part-time work, so have struggled to get motivated to write the blog. When there is no pressure and deadlines to produce, one can get a bit lazy. How time passes and the last four months, while engaged and active – did not see me sharing my blog. I left off with my last post in October 2018 so there has been lots of life since, so below you will find some of what’s been happening for us from last November to now. Thought I should explain a little about this blog – it’s not a travel or how to blog – it’s just a simple “retirement lifestyle blog” – to share what we get up to; the places and things we do. A bit of a hobby to highlight – for family, friends and like-minded others who might think about retirement in Chiang Mai – what it’s like to be retreating in Chiang Mai. It has now been 5 years & it really feels like home. 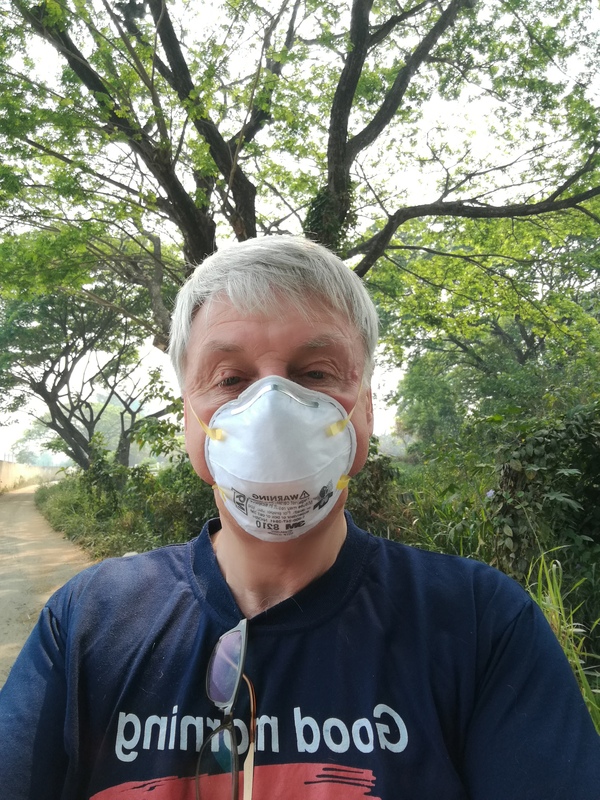 This blog covers a range of topics including: Burning Season, – Ping River, – Day Trips, – Out & About (activities and food), – Around Home, – Medical Update and – What’s Coming Up. It features in many pictures of Chiang Mai. Every day thousands of people pass by or cross over the Ping River without giving it a second glance. But for a dwindling number of people, the Ping is as important today as it was when King Mengrai likely made it the deciding factor for choosing this spot to found Chiang Mai city in 1296. Gaze at it long enough and you will see some signs of life; small boats meander up and down the water and a few locals throw their fishing nets hoping to earn some keep that day. Fish farmers wake up and check on their tilapias and the irrigation department plans the next week’s water supply. Under water, the fish, eels and shellfish hunt and breed while trying to avoid raw sewage where algae begin to bloom. This is the life of the Ping River and it’s something most of us take for granted — but without it Chiang Mai would not be what it is today, or even exist at all. 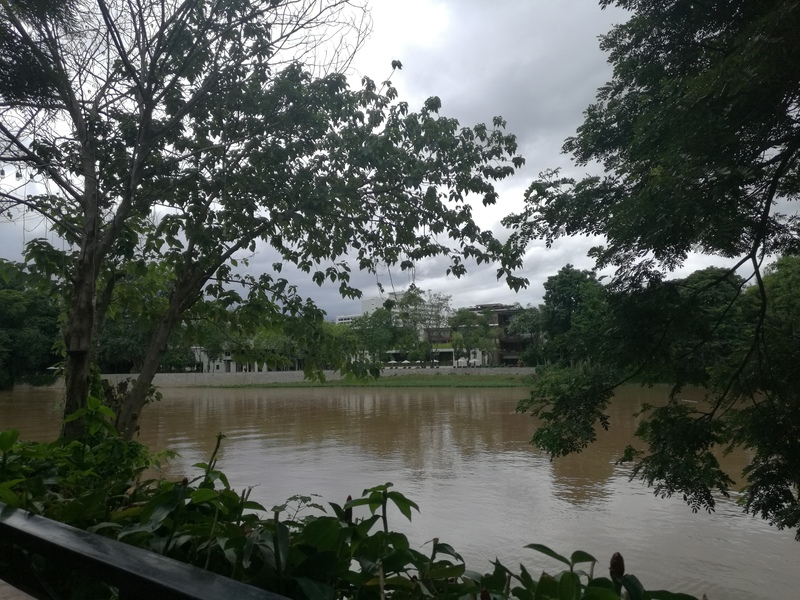 A great article about this river that meanders through the center of Chiang Mai city – its history and what it is today. Check out the Citylife Ping River Story. As a tourist one tries to take in many sights and experiences in the available time. But when you live in a location – you tend not be in a rush to see everything and often put off exploring – (you live here and can do it anytime!). In the early years of our move to Thailand we did more travel and tourist visits around the North. Now it tends to be visits to explore when guests come or we might want to get out on the road for a change of pace. Here are few experiences we enjoyed recently. Hinoki Land – We ventured to the brand new cultural park – Hinoki Land -in Chai Prakan, a picturesque drive 3 hours north of Chiang Mai near Fang. At this recently opened Japanese theme park you can strike a pose in kimono or yukata around a lake against the backdrop of classic Japanese buildings and lush mountains. The centerpiece is the beautiful building constructed of Hinoki pine from Japan. It is apparently privately owned park by a local Thai person who spent years in Japan. The new venture sits on an 83 rai plot of land and is reported to cost about 1.3 billion baht (59 M AUS) to develop. During our visit we took people happy snaps and enjoyed the restaurant for lunch, Japanese cherry blossoms, mountain scenery and coffee by the lake with lots of Koi fish. Doi Inthanon – Cool and clean weather was on offer with lovely flowers on display and enjoyable views. We visited the two chedis (chedi is the Thai word for stupa) which are dedicated to the late king and his wife. They were gifts from the Royal Thai Air Force for their 60th birthdays. The king’s was built in 1987, and the queen’s in 1992. These stupas and the gardens are very beautiful and are situated overlooking some of the most amazing mountain views. When we were there the sky was so blue, clean and crisp air with not too many other visitors. Nice break from the smoky air below. Afternoon iced coffee’s and teas by a busy waterfall on the way home rounded out a nice day. Huay Tung Tao Lake – Took our visitors out to this man-made recreation lake and food spot in Chiang Mai to check out the mighty daddy Kong straw statue, an addition to the popular straw mother-child duo. Daddy Kong, reaches 8 meters in height and stands next to his Kong family on the shores of this popular recreation lake. 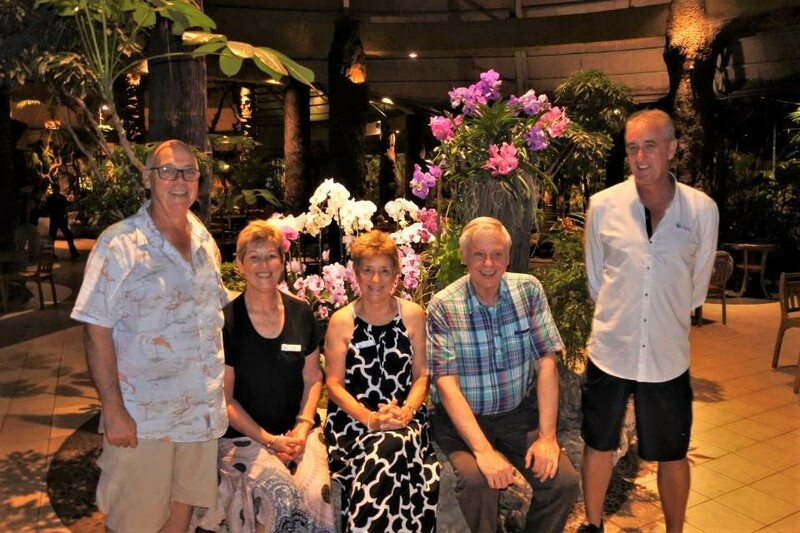 Queen Sirikit Botanical Garden – Enjoyed touring the Queen Sirikit Botanic Gardens with a visitor from Hong Kong. The botanical garden in Mae Rim District, Chiang Mai was opened in 1993 and is maintained under the auspices of the Botanical Garden Organization of the Ministry of Natural Resources and Environment. Never visited before and it is a rather dry time of year but there was still some color on display to enjoy. The rose garden and the aquatic plants were nicely in bloom. The gardens are built on a very step hillside so best to explore with a vehicle so you can stop along the way to explore different displays. If you like color and inventive use of flowers this is for your. Have to love this February time of year in Chiang Mai . It is our cooler season and time for the colorful and amazing Flower Festival weekend. There are flower displays in the city park and then an amazing, colorful parade. Always fun to visit and try out photography skills – see pictures from City Life photographer, Steve. We were invited to watch a Korn dance special performance at the 3 Kings Monument Chiang Mai. It was performed by the Khon Salachalernkrung Royal Theater. The Khon Masked Dance Drama in Thailand, is a performing art that combines musical, vocal, literary, dance, ritual and handicraft elements. Khon performances – which involve graceful dance movements, instrumental and vocal renditions and glittering costumes – depict the glory of Rama, the hero and incarnation of the god Vishnu, who brings order and justice to the world. Traditionally, Khon was performed in the royal or princely courts, and in dance masters’ households. Today, however, performance occurs mostly in educational institutions, while still adhering largely to traditional methods. It was an enjoyable outdoor evening. Enjoyed a fun night out for Australia Day at a Yummy Pizza Restaurant Chiang Mai with 160 others. The owner is from Melbourne and a musician. Lost of food, Aussie treats and music to celebrate. I also performed 3 lucky prize draws thanks to some local sponsors I was able to secure. Check out more pictures on the link. We enjoyed a great social evening at the US Consul Generals residence along with other members for a new year reception. Nice evening in a lovely historic building. Once the royal residence of the last prince of Northern Thailand the history of the Consulate evokes an earlier time of pergolas draped in riotous explosions of bougainvillea, the subtle scent of frangipani, and the gentle breeze of a slowly turning ceiling fan. Previously known as the Chedi Ngarm, or Beautiful Pagoda Palace, the Consulate grounds have a number of distinct historic buildings, some over 100 years old. While not normally a ballet fan, it was great entertainment and wonderful performance by the Chiang Mai Ballet School for a charitable cause. Money raised was to be donated to a needy school. There were some 200 students and visiting dancers who performed for the audience at the Kad Theater. Always happy to participate in this worthwhile event. The dealer is our colleague, the Honorary Counsel of Finland. We joined other guests at the grand opening of his new Ford dealership in the old city. It was a spectacular opening ceremony (Thai’s do this so well), a lovely Italian dinner with some classical music and famous Thai singer for entertainment. Another fun night out in Chiang Mai & should we seek to buy a Ford – this will be the place. Enjoyed strolling around at the City Life Garden Fair charity event, in November. There were so many stalls with treats, products and food to sample. Lots of people enjoying the warm day and entertainment from bands and for a good cause. It takes place for one day, with dozens of volunteers, hundreds of items donated, thousands of goods sold, tens of thousands of people gathered, with the goal of hundreds of thousands of baht raised for charity and millions of baht spent. It’s becoming an annual special event in Chiang Mai. Always fun to stroll around an outdoor market for a great cause. We frequently get up on a Sunday morning, and after coffee, head out to Jing Jai Market. 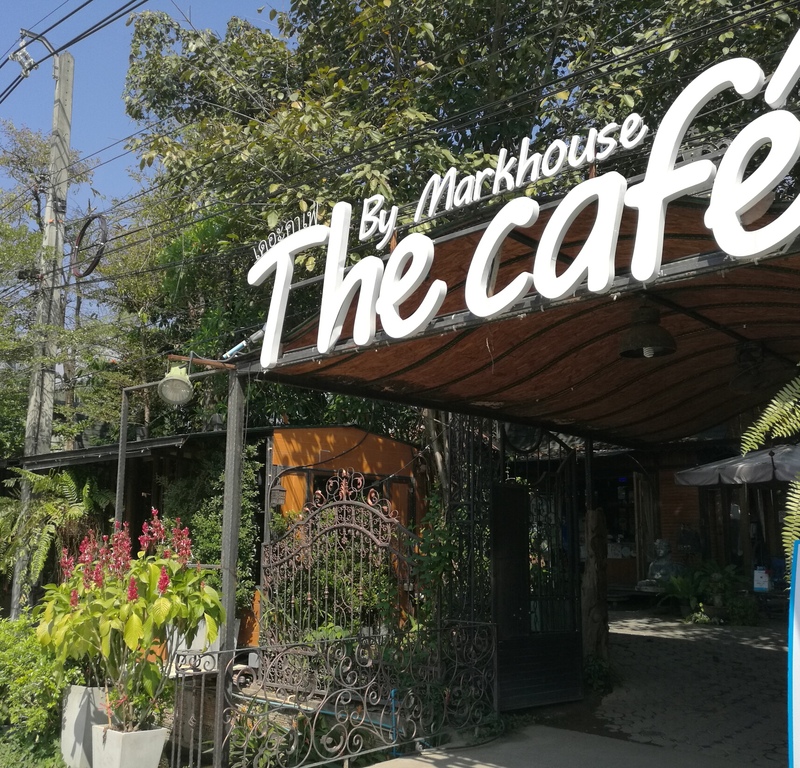 It is a little north of Chiang Mai’s old city and a pleasant area to browse, relax, sip a coffee and is a funky weekend market spot to explore. It is on Saturday and Sunday morning (6:00 – 12:00) with local Thai’s selling organic vegetables, lots of different food and handmade handicrafts. Nearby, and behind JJ Market, is Chiang Mai’s largest plant and garden market. Another great place to explore as there are many varieties of plants native to Southeast Asia. Enjoy heading out to these spots to browse, get entertained and usually find something to eat or buy. Living in Chiang Mai is an experience in itself, but in addition there is always the coffee culture and foodie adventures on offer around town. Here are a few places we have visited – & links to their FB pages – so you can find them. Coffee Addict Cafe & Beyond – @ Lanna Rock Garden – a wonderful rural setting by a stream, large open park area with treed surrounds. They have a deck to sit out on or you can have a bamboo sala by the river. A quiet place for contemplation and refreshments. Good for the dog – he loves to go there too. Fernpresso – a hidden garden and look out spot with views over the Chiang Mai airport. Great for plane spotters and when looking over the airport it brings back aviation memories from my time at Sydney airport – just on a much smaller scale. Nice fern gardens with food and drinks on offer. Sala Cafe – another favorite spot for coffee and cakes very much out in the bush of the Mae Rim area. They do breakfast and lunch as well. Enjoying taking friends and visitors here. Recently took an Australian couple here who recently moved to Chiang Mai. We have a mutual friend back in Australia. Nice cakes on offer to go with your choice of refreshment – such a spoiled life. Petite Cabane – a very friendly and welcoming little place, close by our house that we pop into from time to time. Run by two lovely guys (Thai and French) and nice place to visit for their home made temptations. Never know what they have baked up to offer you with your drinks. A neat little foodies spot outside of town. Thai food on offer that is delicious and some dishes are from their Australian restaurant. It is run by an Thai-Australian chef/family who spent many years in NSW and had a restaurant there – in Bowral, NSW. Jai Yong Art Gallery – there is a quaint old style Thai food restaurant in front of this art gallery out Sankampheang way. It is a busy place, most popular for the inexpensive Thai food and unique old world charm. Behind is an amazing art gallery that is worth a visit to view the art work. Khaomao-khaofang – has created a beautiful harmony between the natural flora, delicious fresh food and friendly service. An imaginary Jungle experience with numerous plants and beautiful waterfalls to give a cool and relaxing atmosphere during the day, with warm and delightful lights & music at night. 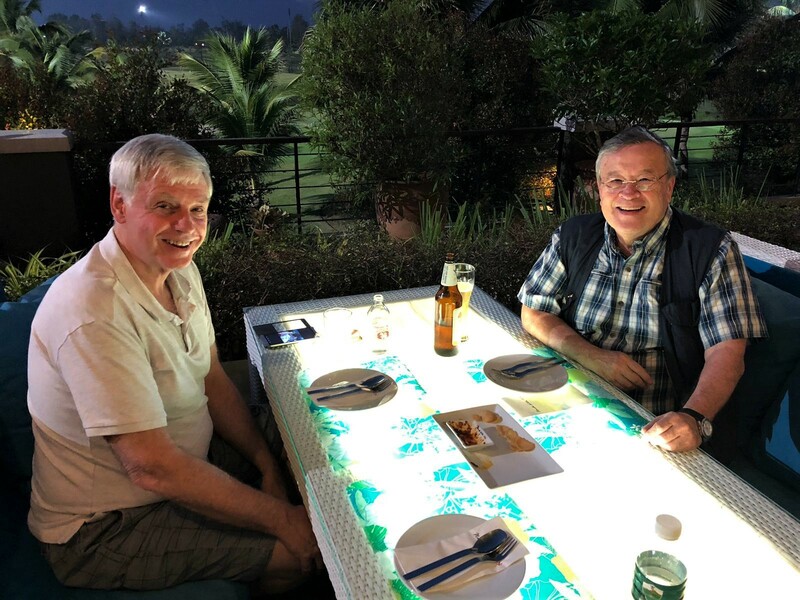 We enjoyed an evening here with some visiting Australian swim instructors and coaches along with the Rotary Club president & have come back on other occasions. At Khua Lek – a relaxed and inexpensive food spot on the Ping River, near the Iron Bridge in town. We like to eat here fairly often when in town and our stomachs say it’s time for a feed. I like the early evening best as the sun sets over the city. Good menu selection. Mix – North Hill Golf Course – This is one of our favorite dinner restaurants near our house. Mix has a very wide-ranging menu, good food and the location vistas at the golf course are always enjoyable. Sun sets with the hills around Chiang Mai as a backdrop are scenic. It is always a relaxed feeling and service is great. Faces Gastro Bar – Sampled the menu here for a simple celebration following completion of my recent medical treatments. A most unusual venue with interesting decor in the old city with enjoyable food. The Nest – This one is in Mae Rim. It is a boutique restaurant among the trees and vegetation surrounding a small hotel. Tucked away down some Soi’s that can be a challenge to find, but it is a worthwhile journey and a delightful treat for lunch. Always wonderful food and service. We enjoy taking friend’s there for lunch when the opportunity presents itself. See their Facebook link for details. Things have been fairly routine around the house. No major drama’s or repairs have been required so that is always a good feeling. Always enjoy our life around home and the cat and dog – great to have pets about. Our cat enjoys the garden outlook lounging on his perch. Our dog likes his country walks. Oh a relaxed life. Visitors – not over run but on occasion we do have visitors. Ace’s mother has been with us a number of times in the past 4 months for medical check ups. This offered us the chance to get out and about to visit places of interest. Recently I had a wonderful catch up with a “troop mate” from my RCMP training days. We hadn’t seen each other for 50 years and it was a weekend to remember our young, fun days. Calvin lives in Hong Kong – the past 15 years – but is returning to Canada. We enjoyed swapping stories over dinner at North Hill golf course, lunch at Nest Mae Rim and afternoon tea at Charin Pie with apple pie & ice cream. We took time to visit the Queen Sirikit Botanical Gardens, temple at Doi Suthep, toured the old city and got to swap stories from years ago to learn about the paths of our lives & what became of old troop mates. Garden Color – Winter weather is a good time for color in the garden. Different times of the year produce different flowering plants to enjoy. Really happy with our little villa garden and what it produces. Fairly easy care but nice to relax in and enjoy. Xmas Holiday Season – We had a lovely Christmas eve lunch with friends at the Consuls Garden, a very lovely spot on the Ping River. Historically the restaurant is on the grounds of the former British Consul in Chiang Mai. Christmas day saw a lunch feast with much food and many friends enjoyed at an Australian couples home. A beaut-day with friends. We also joined in the festivities for the Christmas tree lighting at the Shangr-la Hotel. A special treat was on hand for some children from Agapae Home who came along to sing, meet Santa and enjoy a great feed. In the Christmas spirit, we headed to the oldest Church in Chiang Mai (Christian School Chapel) for the All Saints Festival of Carols. The event was in aid of the Youth Charity Foundation. We enjoyed singing lots of Carols – with the great voices of the Lannacapella choir. Children from the orphanage delivered some entertaining songs. Prostate Cancer Journey – I finished my 7 weeks of radiation therapy on 2 November. On the 29 November I had another 3 month injection of Enantone LP (leuprolide) 11.25 mg. It works by decreasing levels of testosterone produced. This prevents the growth of tumors that need these hormones to grow. The journey has been tolerable although there has been some unpleasant side effects during the treatments. Given the they radiate the prostate area and pelvic lymph nodes, your imagination can explain the implications of the likely organs affected and associated problems. I do find that motivation is often lacking and my tiredness comes on mainly in the afternoon. While it hasn’t limited me from general work and life activities, I have found that restricting late afternoon outings to be beneficial. The next doctors visit is at the end of May for monitoring of PSA and testosterone recovery. Time will tell if these secondary treatments after my initial prostate surgery will be successful in either – eliminating PCa or putting it into remission. I recently read about a study of a combination salvage therapy in prostate cancer. It is the combination treatment regime I have followed – the results – “Freedom from disease progression at 5 years was 89.1% when radiotherapy of the pelvic lymph nodes was added to short-term androgen-deprivation therapy and prostate bed radiation therapy for patients with rising PSA levels after prostatectomy.” – Here’s hoping I am in the 89% from following this treatment strategy. Life is good – no, it’s great. 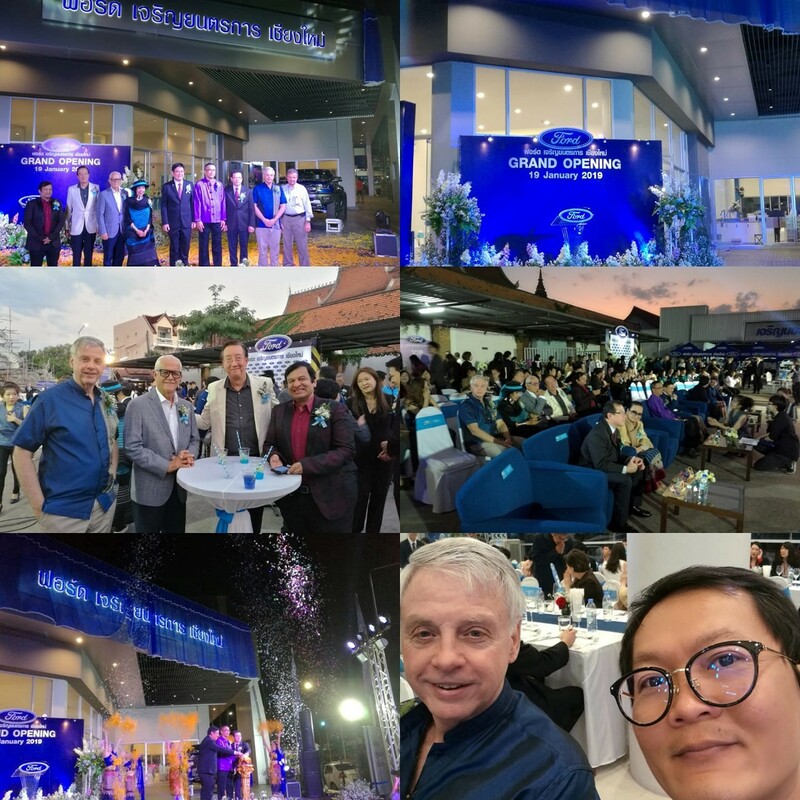 We are looking forward to a few events and I expect the coming months to be busy and engaging as we head into the very hot summer time period in northern Thailand. There will be lots more of the – Tranquil in Thailand – life and some likely surprises. Songkran Festival – The Thai new year is a lot of fun and the biggest celebrated festival in Thailand. It is held on the 13th- 15th April. Songkran is the longest and most anticipated public holiday in Thailand and commonly the time when Thais who are based in cities like Bangkok return back home to their families living in small towns or the countryside. 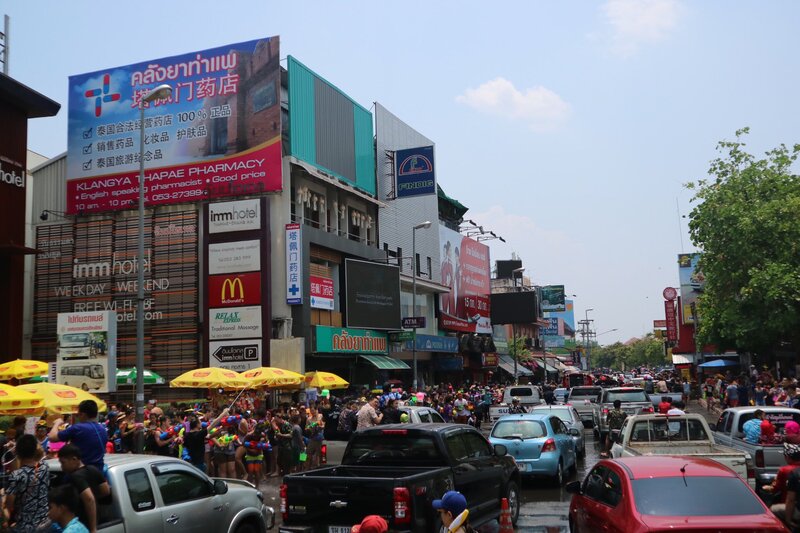 Songkran has evolved into a spectacular event – you will suddenly see the usually reserved Thais becoming uproarious with incredible level of energy waiting on the street for people to pass by, ready to unload their water pistols or to dump buckets full of water on you. Forget about escaping or finding any safe places! Only monks, babies and elderly are excused. It’s the hottest time of year so it is OK to get wet. See details in the link. 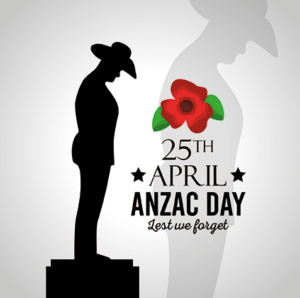 Anzac Day Dawn Service – Looking forward to this event. It has been offered for over 12 years in Chiang Mai. Check out the event link for details.